Before booking a holiday that includes the family pet you should consider a few points about the animal and whether it is a good idea to take him with you. Does your family pet enjoy travelling in the car or on public transport? Will you be able to transport him safely while carrying luggage and the hundred and one things that you cannot live without for your fourteen-day vacation? If you decide to leave your pet at home you may need to find a kennel or cattery that will take him. Some establishments are so popular that people book a year in advance so if you decide not to take your pet with you then you'd better book quickly. Ask your vet if he will take a boarder if you are not intending to take your exotic pet on holiday with you. Quite often the pet shops that sell these types of pets will take them back for a short break. If you bought you pet from a breeder he may be happy to board the pet for a short while. It's always best to check out an establishment before booking in your family pet. Ask at your veterinary clinic or talk to friends, family and colleagues. It will soon become apparent what establishments not to use. Any decent kennel or cattery will also let you view the facilities before you book in your animal. For the first time overseas pet traveller it can take longer to arrange his passport than it can to organise and book your own holiday. Contact your vet for the necessary blood tests and injections before paying any money in travel fees for the animal. Check with the owner of the holiday destination that you are visiting to see if pets are allowed. Quite often there is an extra fee for the pet and also restrictions as to where it can sleep. It would be foolhardy to leave a pet alone in the bedroom whilst you go for your meals so you need to take a cage with you or arrange to rent one at the destination. Decide whether your pet really needs to go on holiday with you. They do not need vacations in the same way that we do. They may be uncomfortable in the hot sun or visiting boring tourist sites. Many theme parks and tourist attractions do not allow dogs inside the venue. Would it be fair to leave your dog in the car all day when the family is enjoying themselves? Most of these venues do have facilities for dogs. But this means that there is a shady place for you to park the car and perhaps a water point. Where will your pet be while you are eating in restaurants? He will not be allowed inside. Would this hinder the enjoyment of your holiday? What if you are taking your cat on holiday; will she like the beach? The noise? The strange environment? Wouldn't she be happier stretched out in her own back garden being looked After by a friendly neighbour? Think seriously before planning to take the family pet away on holiday with you. Sometimes a break from each other is the ideal solution. 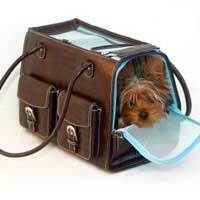 Which Pets Can Travel Overseas?